Prime Minister Narendra Modi said that his government would go ahead with a land transfer deal with Bangladesh keeping illegal influx and Assam’s long-term security interests in mind. Bangladesh stands to gain some 10,000 acres of land through this deal the UPA government had initiated in 2011 and placed as a bill for ratification in Rajya Sabha in December last year. 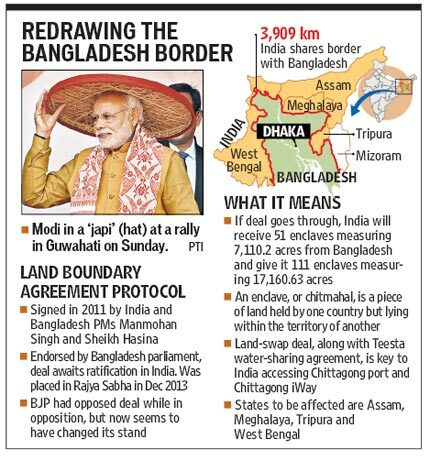 The BJP in Assam had opposed this deal, as did the Trinamool Congress in West Bengal. 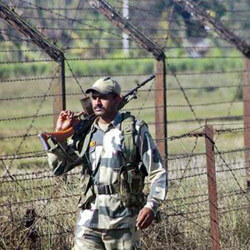 Infiltration from Bangladesh is a major issue in the Northeast. It is viewed as a demographic invasion designed to out-populate scores of indigenous communities in the region. The Prime Minister said there would be no compromise with the security of the strategic Northeast. “The forces trying to destabilise Assam and the Northeast should know that Delhi has a new government and the law will not spare them now,” he said. Insisting that the BJP brand of politics was not based on casteism, communalism or regionalism, Modi said his party believes in nationalism. “Our mantra of inclusive development has compelled all political parties to rework their agendas,” he said, adding that his government has special plans for the Northeast.